You may receive updates from AFL-CIO, NARAL Pro-Choice America, Coalition of Labor Union Women (CLUW), and People For the American Way, the sponsors of this form. 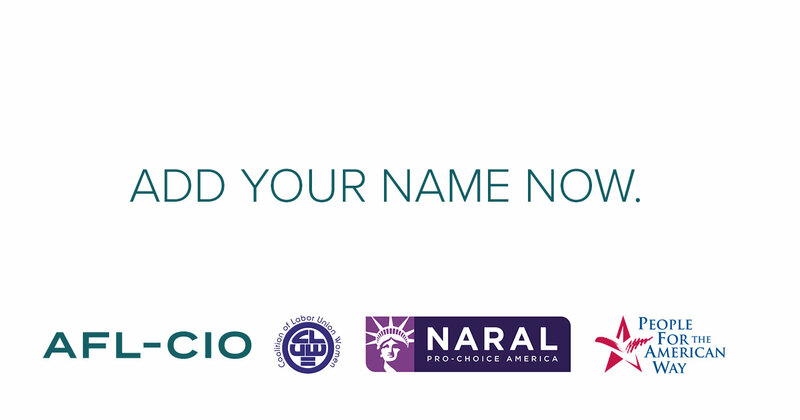 You may receive updates from NARAL Pro-Choice America, who shared this form with you. April 2 is Equal Pay Day, the day women “catch up” with what men were paid last year. It’s disgraceful that in 2019, women still get paid less on average for the same work, earning only 80 cents for every dollar men make. Americans are working harder and longer than ever, but wages remain too low for millions of families to make ends meet. The lack of basic labor protections makes it nearly impossible for many workers to balance the demands of job and family. Now, legislation is moving through Congress to finally help close the gap. The bipartisan Paycheck Fairness Act would update the Equal Pay Act of 1963 to close loopholes and break harmful patterns of pay discrimination, requiring employers to report pay data to the EEOC and prohibiting them from retaliating against women who discuss their pay with co-workers. While belonging to a union is still the surest way to guarantee equal pay on the job, with unionized women making approximately 27% more than their nonunion counterparts, the Paycheck Fairness Act would provide new and important tools to close the wage gap. Support women by signing the petition for equal pay for equal work!